Welcome to another week of our Slow Cooker Series!! Dana from This Silly Girl’s Life and I are each sharing a new slow cooker recipe every week this month so you get double the yumminess!! This week I revamped the photos my Slow Cooker 3 Ingredient Beef Tip recipe that I got from my grandma. Once there is a nip in the air these dinner is on weekly rotation. It is extremely easy and super flavorful and makes a great gravy for noodles, rice or mashed potatoes. It really doesn’t get any easy than dump one package stew beef, one can cream of mushroom soup and one can cream of onion soup into your crockpot turn it on and wait for a hearty, comforting dinner to be cooked for you. The beef come out fall apart tender and the gravy is so rich and savory it is amazing that such a delicious meal can be made with just three ingredients. Now you can tweak this recipe and easily turn it into a beef stew by adding potatoes or veggies later on before it’s done cooking. Dana made these amazing Slow Cooker Roasted Garlic Mashed Potatoes this week and I cannot wait to make some!! Check out last weeks Slow Cooker Recipes! Your slow cooker recipes look FANTASTIC! I’ll have to try them all. Thanks for sharing these! Hi Parrish. I’m stopping by from Tasty Tuesdays and Two Girls Blog Share and just ’cause I love ya. 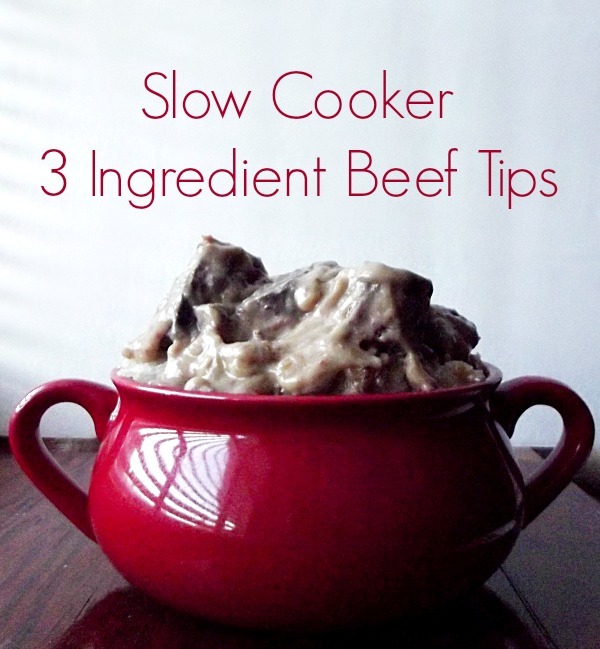 I <3 my slow cooker and I can't wait to try your 3 Ingredient Beef Tips. What's not to love, 3 ingredients in a slow cooker to a wonderful supper. Thanks for sharing. I love when the weather gets cooler and my slow cooker takes permanent residence on my counter :) This sounds so easy and delicious–the perfect thing to come home to after a long day at work! Wow, so easy! Thank you! We love our slow cooker for summer meals so we don’t have to heat up the kitchen. This sounds so EASY AND YUMMY :) I am always looking for new recipes :) Thanks! I’m always looking for fabulous crockpot recipes, and even better is a 3 ingredient recipe! Thanks for sharing! I’m pinning this to Pinterest now! Love this! Thanks for linking it up. I’ll be featuring it this weekend on the link party. Have a great night! Oh, this looks so good. I love using my slow cooker for busy nights because it is easy to get a meal on the table without a ton of prep work.